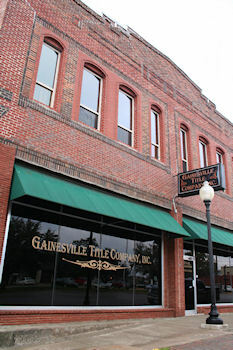 Gainesville Title Company, Inc. is an independent title company providing title insurance policies and related real estate products and services. We are located in Gainesville, Texas, the county seat for Cooke County, Texas. Gainesville, Texas is located about 60 miles North of the Dallas/Ft. Worth Metroplex. Gainesville Title Company writes and supports the issuance of title insurance policies through our two underwriters - Chicago Title Insurance Company and Lawyers Title Insurance Company. We also coordinate searches, title products and closing services for commercial service customers. In addition to title insurance, we are a qualified intermediary in connection with § 1031 exchanges of like-kind property. The Company is aware of the need for fast and accurate results. Therefore, the latest technologies have been implemented for improved customer services. Our mission is to provide market-responsive, real estate products and provide our customers with unparallel customer service throughout the closing process. Our IT department has recently introduced new software, which automates the issuance of policies. As a result, we are able to guarantee one to two week delivery of your policy. Our office is paperless with the exception of recordings and policies. If you are a lender, ask us about eClose, the paperless solution. Gainesville Title Company is the place to go for Cooke County Title Services. We would appreciate the opportunity to serve your Cooke County title needs!